A castle is a large building or group of buildings fortified against attack. But many buildings that are called “Castle” are in fact big houses with castle-like features, but aren’t actually fortified, and wouldn’t withstand a serious assault for very long. One look at Edinburgh Castle tells you that it’s the real thing: An enormous collection of buildings that tower over the city of Edinburgh from the top of a 250ft basalt cliff face - only the most determined or foolish of enemies would even attempt to attack it. Archaeologists have found evidence that people have occupied this site since the Iron Age, making it the oldest continuously occupied place in Scotland. 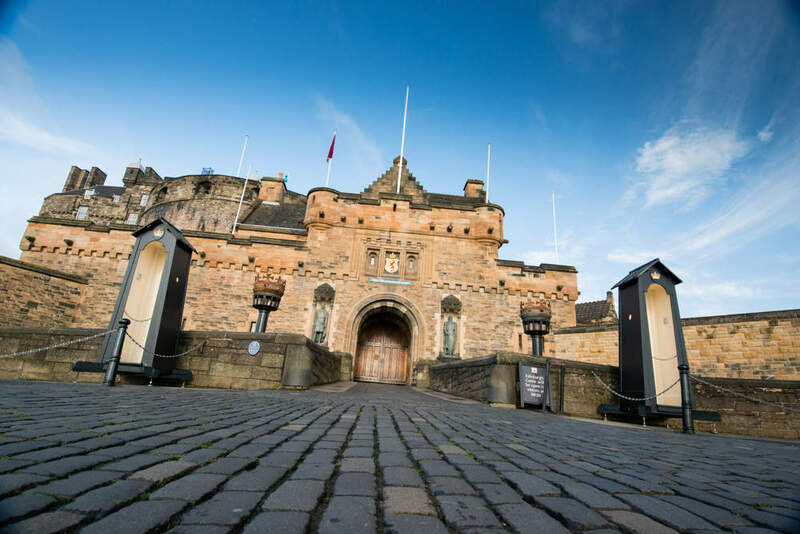 During WWII the Crown of Scotland was hidden beneath a medieval latrine within the castle, just in case German troops invaded! 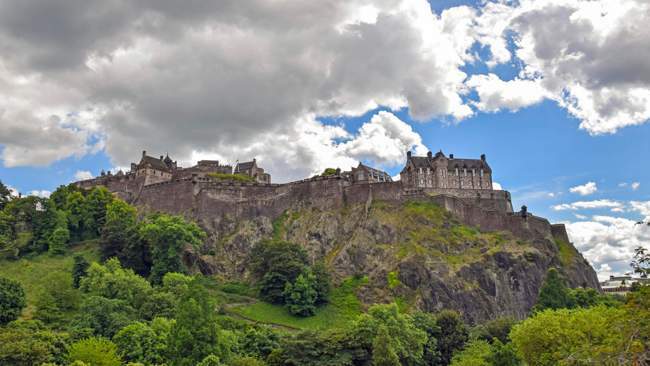 Edinburgh Castle is the most popular paid attraction in Scotland, with more than a million visitors each year. The Royal Edinburgh Military Tattoo takes place on the castle esplanade every August, and is watched live by more than 200,000 people, and an estimated TV audience of 100 million more! St Margaret’s Chapel, within the castle, is the oldest building in Scotland. Jacobite rebels tried to storm the castle in 1715, but their ladder was too short and they were discovered and arrested. The Scottish crown jewels were lost in the castle for 100 years. They were found in 1818 by a group including Sir Walter Scott. More than 1,000 prisoners have been locked up in the dungeons in the 18th and 19th centuries. The castle has been captured and re-captured by the English and the Scots several times between the 11th and 14th centuries. Hundreds of “witches” were burned at the stake on the Castle Esplanade! Edinburgh Castle is not just a tourist attraction - it’s still in use as a military base today! 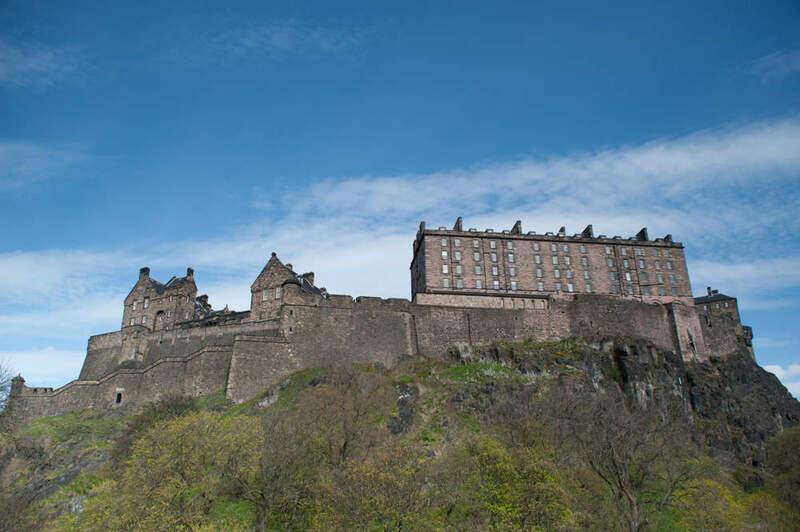 The imposing basalt rock on which Edinburgh Castle sits is known (unsurprisingly) as Castle Rock. Castle Rock is a plug of basalt which formed more than 350 million years ago and seals an extinct volcano. The summit of the rock is more than 430ft above sea level. With steep and jagged rocks to the North, West and South, the only viable approach to the castle is from the East, which is why it’s such a wonderful defensive position. Visitors to the castle can take a guided tour, which is included in the ticket price. 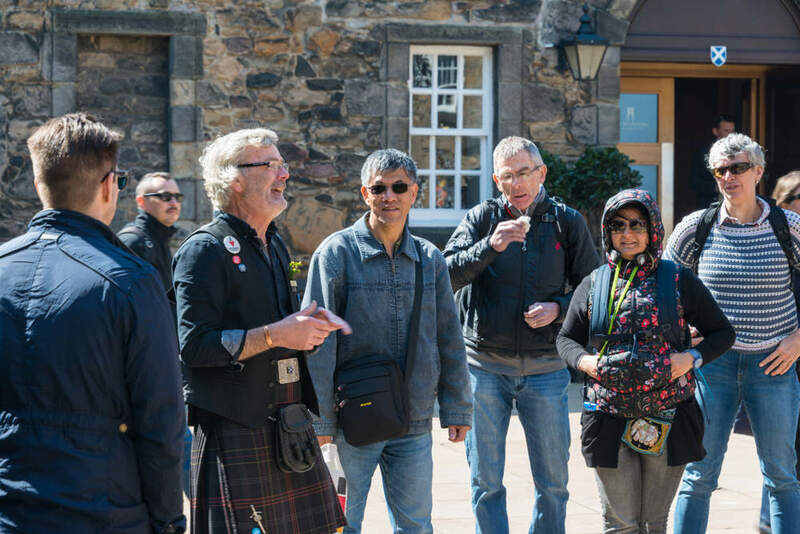 We recommend this for first-time visitors - Edinburgh Castle is very large, and there’s a lot to see - the expert guides will make sure you don’t miss anything important, and love to tell stories from the Castle’s long and fascinating history. If you prefer to explore at your own pace, you can hire an audio tour from the booth that you’ll find beyond the Portcullis Gate. Audio tours are available in English, French, Spanish, Italian, Russian, Japanese and Mandarin. 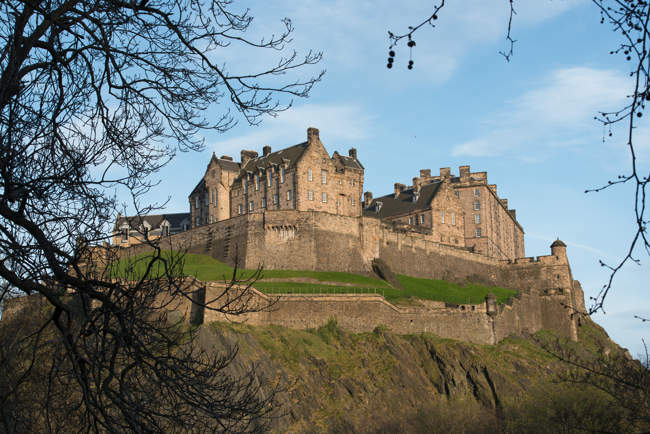 Many people believe Edinburgh Castle is haunted. Having been home to more than 1,000 prisoners, and no doubt the death of several, the dungeons beneath the castle have seen many reports of paranormal activity. There have certainly been many violent deaths in the castle over the centuries, so perhaps the restless spirits of the departed still wander the battlements and corridors! Watch out for them when you visit! 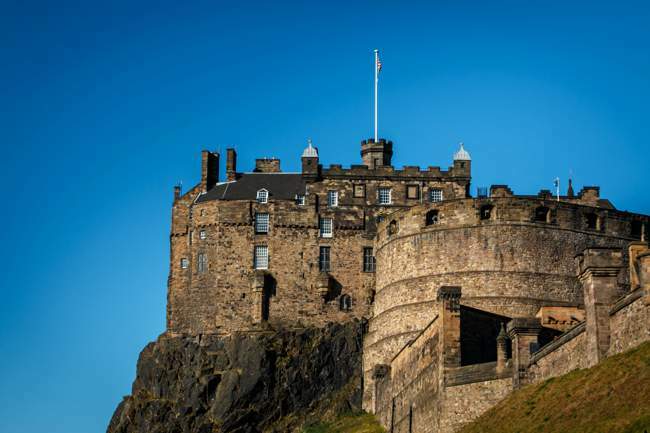 When secret tunnels were discovered leading from the Castle to the Royal Mile, investigators sent a man with bagpipes to explore the tunnels. The idea was that he would play his pipes as he explored, allowing those on the surface to track his position. Unfortunately, he hadn’t gone very far when the music stopped, and although several search parties were sent into the tunnels, no trace of the bagpiper was ever found, but they say his ghost can still be heard playing his pipes beneath the castle. One old story says that the castle is haunted by a headless drummer boy - but although he’s sometimes heard, he hasn’t been seen for hundreds of years as he only appears to warn of an attack on the castle - something that hasn’t happened for centuries. One prisoner attempted to escape from the dungeons by hiding in a barrow of dung. He fell to his death when the barrow was emptied down the rocky cliffs that surround the castle. Some visitors have reported smelling a strong smell of dung just before a feeling of being shoved from the battlements - so be careful when you’re admiring the views over Edinburgh, lest you share his gruesome fate! Janet Douglas, Lady of Glamis was burned at the stake in 1537, and her son was forced to watch from the battlements. Her ghost still wanders the castle, and unexplained hammering sounds are believed to be the sounds of workmen constructing the platform for her fiery execution. Kids love castles, and there’s so much that they’ll enjoy at Edinburgh Castle that they’re sure to have a great day. There are plenty of clues throughout the castle, and they can always ask one of the friendly guides if they need a bit of extra help. 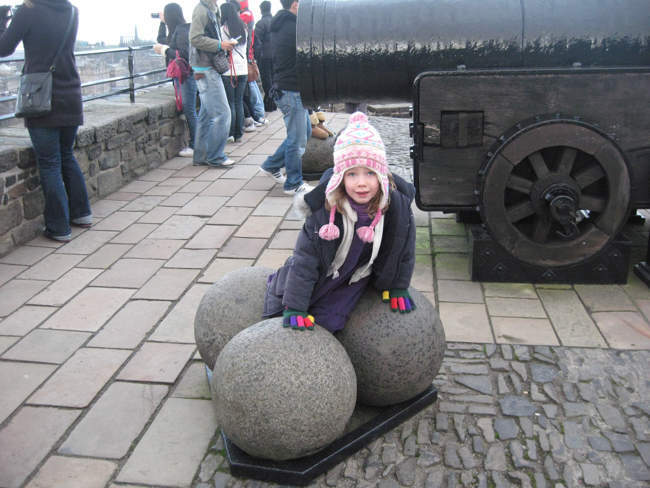 Mons Meg - Kids will love the enormous cannon - and can’t fail to be excited to learn that if it fired one of its enormous cannon balls from the castle, it would land in the sea! The Crown Jewels - The Honours of Scotland are not only beautiful to look at, but have a great story: They were hidden from Oliver Cromwell’s army in 1651. And they were once lost after being locked away in 1707 after the Treaty of Union between England and Scotland, only to be re-discovered by Sir Walter Scott in 1818. The One o’Clock Gun - The dramatic firing of the One o’Clock gun from the castle ramparts is always a favourite with children (and grown-ups too!). The Dungeons - Sure to capture children’s imaginations - even before you tell them that real pirates were locked up there - and a five year old drummer boy captured at the Battle of Trafalgar! 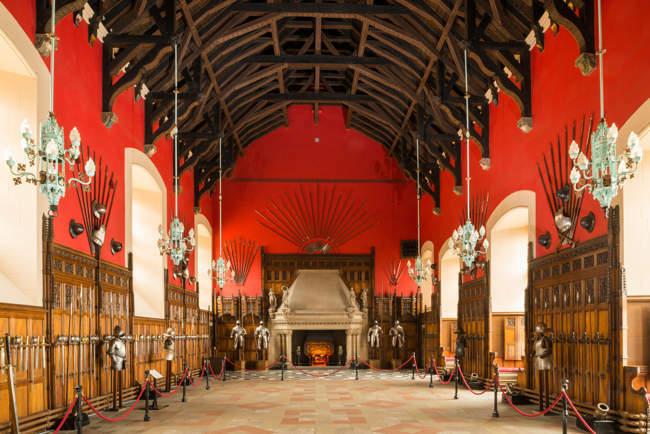 The Great Hall - Fantastic displays of swords and armour appeal to all ages, and kids love finding the faces carved into the stonework. 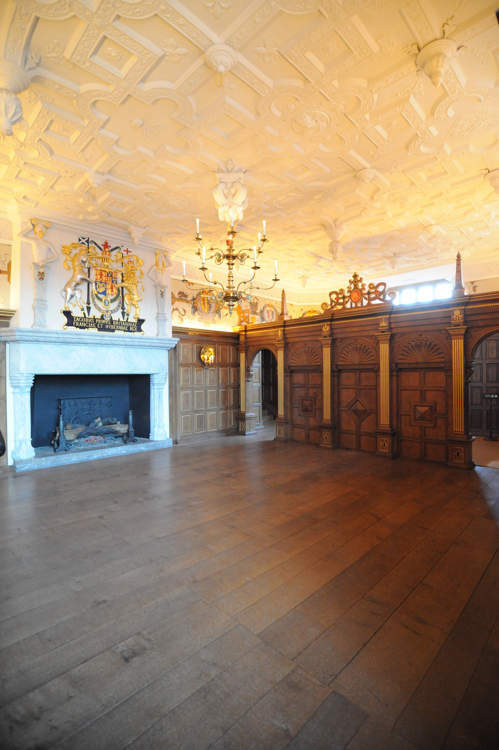 Imagine the Royal Banquets that used to be held in this room! The Cafe - When its time for a banquet of your own, the Redcoat Cafe offers a kids’ box that will appeal to younger visitors. Historic Scotland Members can simply show their card at Visitor Information and avoid the queues for tickets altogether. 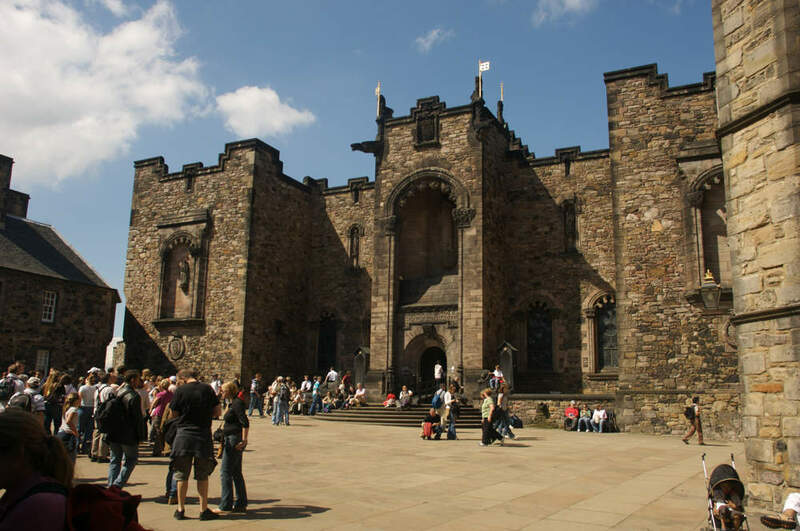 Remember - Edinburgh Castle tickets include a tour of the castle with a knowledgable tour guide. Audio guides can be hired for an extra fee. The enormous cannon known as Mons Meg was state of the art military hardware in 1457, and with its calibre of 20 inches (510mm) it remains one of the world’s largest calibre canons to this day. It was one of two siege guns presented to King James II by the Duke of Burgundy. Mons Meg was capable of firing a 150kg cannonball for more than two and a half miles - it must have been an awe-inspiring weapon in the 1400s. The great gun saw action in the siege of Norham Castle in 1497, but its weight of nearly 7 tons meant that it could only be moved 3 miles per day, so it was mainly used on ceremonial occasions. The cannon was fired in 1558, to celebrate Mary Queen of Scots marriage, and again in 1861. Unfortunately on that occasion the barrel burst - and the gun can no longer be fired. Mons Meg used to reside at the Tower of London but was returned to Edinburgh Castle in 1829 and today it’s one of the castle’s most popular attractions. 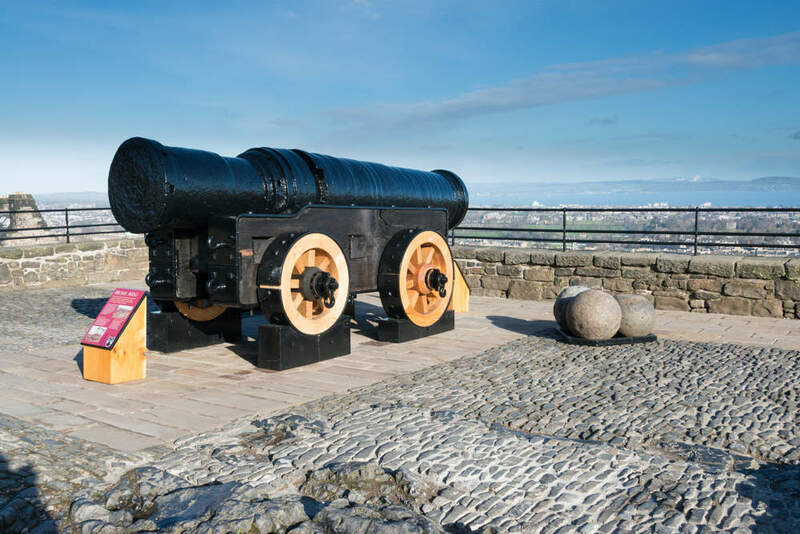 The cannon is normally displayed inside, to protect it from the elements, although it has appeared on the castle battlements on very rare occasions. Also known as the Stone of Scone (pronounced “skoon”), the stone of destiny is an important symbol of the Scottish monarchy. 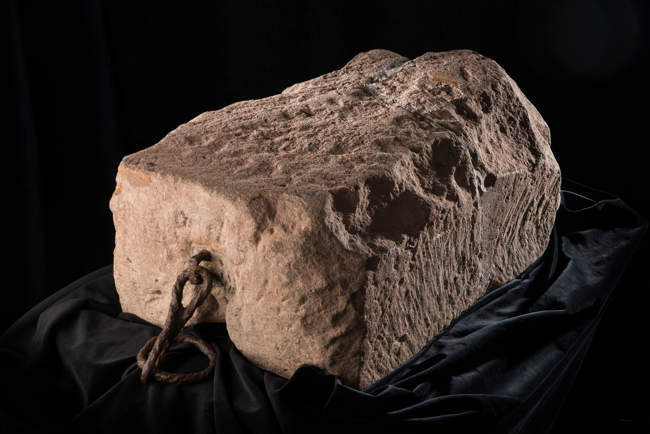 According to legend the stone is sacred - used as a pillow by Jacob in Biblical times when he dreamed of Jacob’s ladder and later brought to Scotland where it came to reside at Scone in Perthshire. In fact geologists now believe it was quarried near Scone. In 1296, Edward I of England had the stone removed from Scone and built into his throne. The stone has been used in English and British monarchs’ coronation ceremonies ever since. On Christmas Day 1950, four Scottish students took the stone from Westminster Abbey to return it to Scotland. Unfortunately they broke it in the process! In April 1951 the stone was left on the altar at Arbroath Abbey, and subsequently returned to Westminster Abbey. 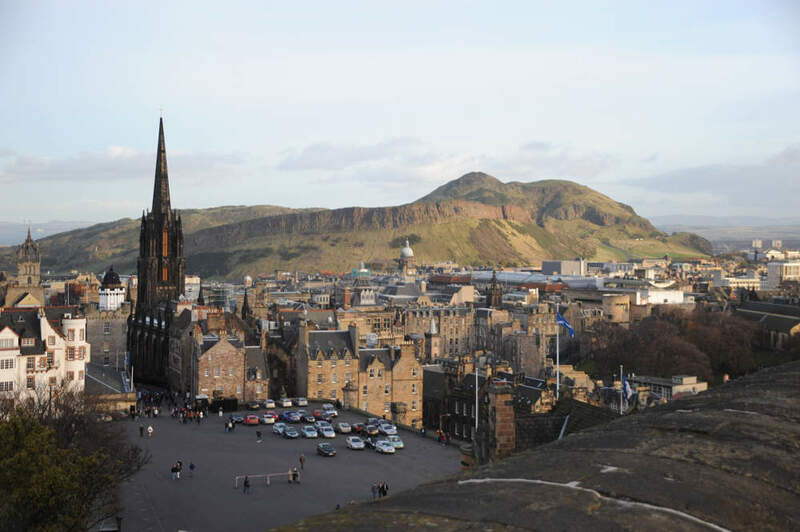 In 1996 the stone was returned to be kept in Scotland when not in use for coronation ceremonies. You can see this historic stone displayed alongside the Crown Jewels of Scotland in the Crown Room at Edinburgh Castle. 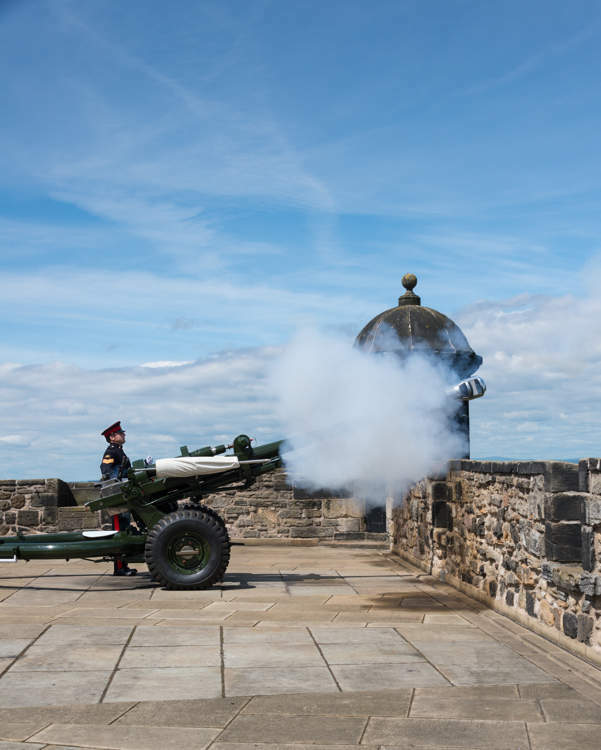 At precisely 1pm every day (except Sundays, Christmas Day and Good Friday), a gun is fired from the Mills Mount Battery, just outside the cafe. It’s a popular spectacle with visitors, and of course it only happens once per day, so keep an eye on your watch if you want to see it being fired. The tradition started in 1861, when a gun was fired to allow ships in the Firth of Forth to set their clocks, as the Time Ball on the Nelson Monument was no use in the frequently foggy weather. Originally an 18 pound cannon, various guns have been used over the years. The gun in use today is a modern 105mm L118 howitzer field gun, known as the “light gun”. It weighs 1858kg, and if used with live ammunition, would have a firing range of more than 10 miles. 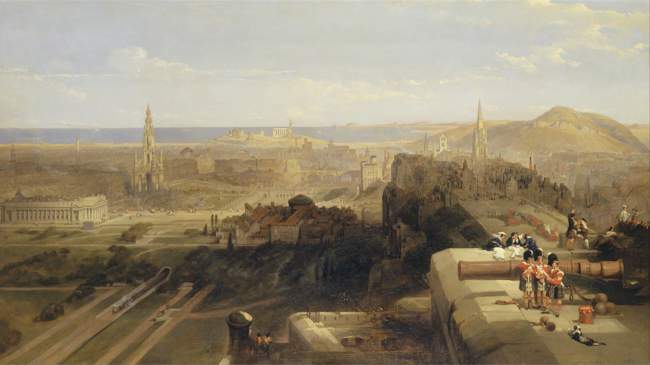 Standing on the Argyle Battery you will have uninterrupted views over the city and North towards Fife. 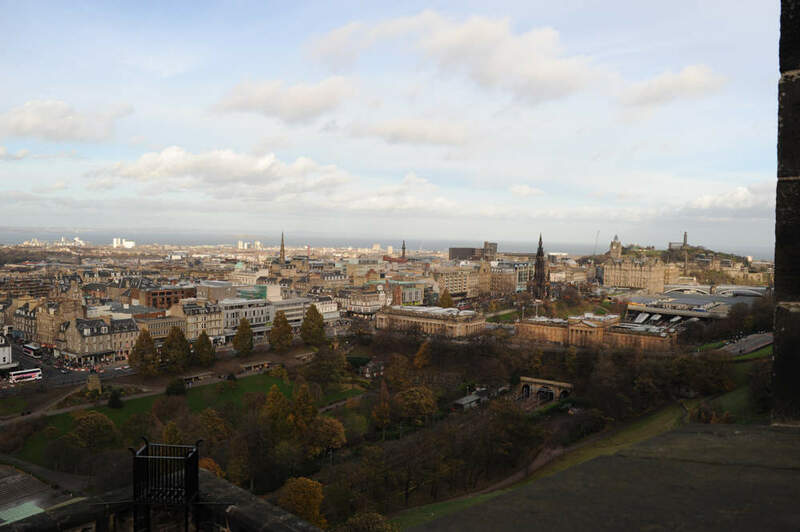 From the Western Battlements you can enjoy views of the West of Edinburgh and on a clear winters day you might catch a glimpse of snow capped Highland peaks. 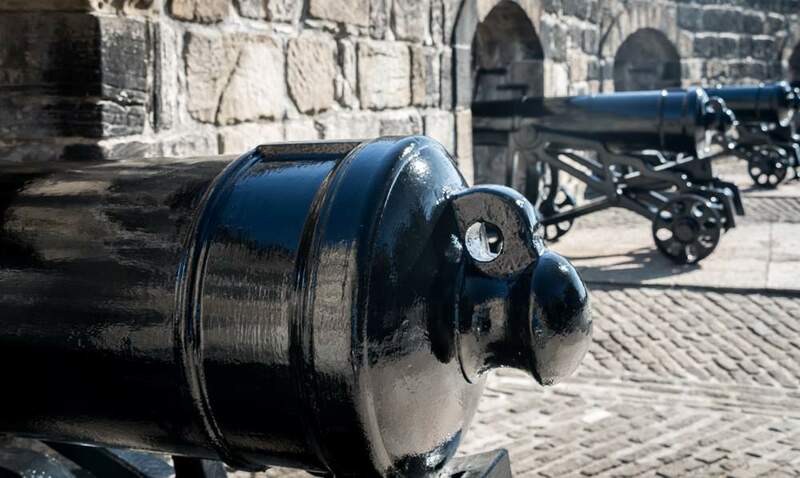 You’ll find the Argyll Battery by taking the steps down from the One o’Clock gun - it’s a great place enjoy views of the city away from the crowds as many visitors don’t find it! Originally a ceremonial and banqueting hall for James IV, the Great Hall at the heart of Edinburgh Castle was built to impress - and it continues to do that today. Enjoy the awe-inspiring hammer beam roof, supported by stones with carved faces, and symbols. Around the walls there is a magnificent display of arms and armour, including swords, axes, pikes, spears and more. Many royals have lived at Edinburgh Castle through the centuries, so there had to be a palace within its walls, appropriate to their status. 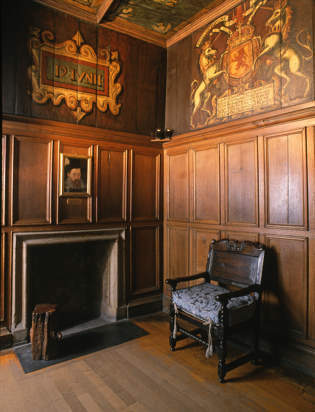 James VI was born to Mary Queen of Scots in the Royal Palace in 1566, in the room now known as the Birth Chamber. The Crown Room on the first floor is home to the Scottish Crown Jewels and the Stone of Scone. 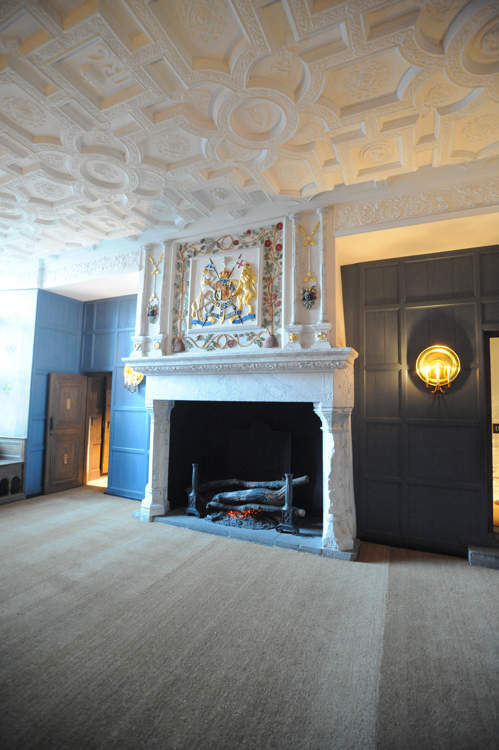 Today visitors will enjoy the beautifully appointed rooms, enormous fireplaces, ornate plaster ceilings, and portraits of monarchs that hang on the wood-panelled walls. The Crown Jewels of Scotland are known as The Honours of Scotland. You’ll find them on display on the first floor of the Royal Palace, off Crown Square. 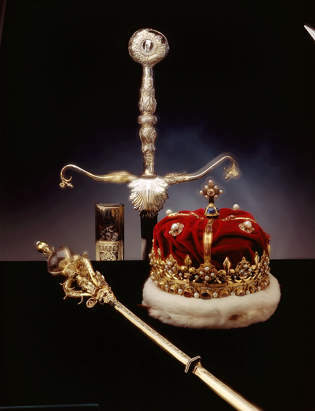 The sceptre is made of silver gilt topped with a polished rock and a Scottish pearl, and can be traced back to 1494 when it was given to James IV by the Pope. The crown, made from Scottish gold adorned with 22 gemstones and pearls from Scottish rivers, was first worn for the coronation of James V’s wife in 1540. They were first used together in 1543, for Mary Queen of Scots’ coronation. In 1651 they were hidden away to keep them safe from Cromwell’s army, and again in 1707 they were locked away after the Treaty of Union between Scotland and England. Unfortunately over the following century their hiding place was forgotten, until they were re-discovered by Sir Walter Scott in 1818. 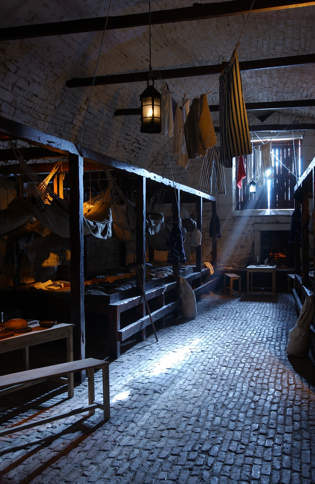 More accurately (but less excitingly) known as the Prisons of War, this recreation offers an insight into the conditions endured by the many prisoners who languished in Edinburgh Castle over the centuries. Everyone from French Privateers to real pirates from the Caribbean were held in vaults like these - and most were eventually hanged. The vaults continued to be used until a mass breakout by French prisoners in 1811 persuaded the authorities to build more suitable (and secure) prison buildings elsewhere. Opened in 1933, the National War Museum contains a large collection of artefacts from more than 400 years of conflicts. The museum offers a range of permanent and special exhibitions that tell the story of Scotland at War through the ages through a range of artefacts ranging from ancient swords to the latest high tech equipment. There is also an important collection of paintings on military subjects and a comprehensive research library for those studying military history in depth. 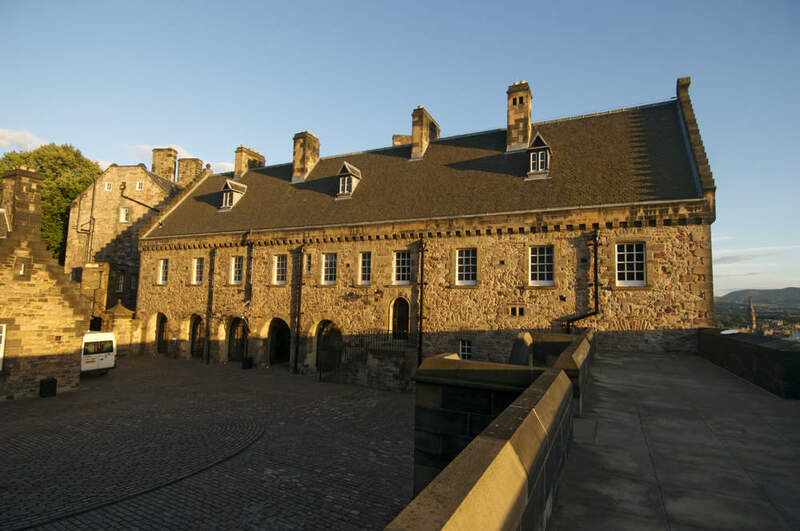 The Regimental Museums of the Royal Scots and the Royal Scots Dragoon Guards can be found before Foog’s gate. First proposed in 1917, the Scottish National War Memorial commemorates Scottish soldiers, and all who served with Scottish regiments who lost their lives in the two World Wars and subsequent conflicts. A sealed casket on the altar contains the names of 147,000 soldiers who died in the First World War, 50,000 more who perished in the Second World War, and sadly names continue to be added to this day. Within the memorial building, there are monuments to each individual Scottish regiment. Visitors to the memorial will find it a moving and thought-provoking experience. 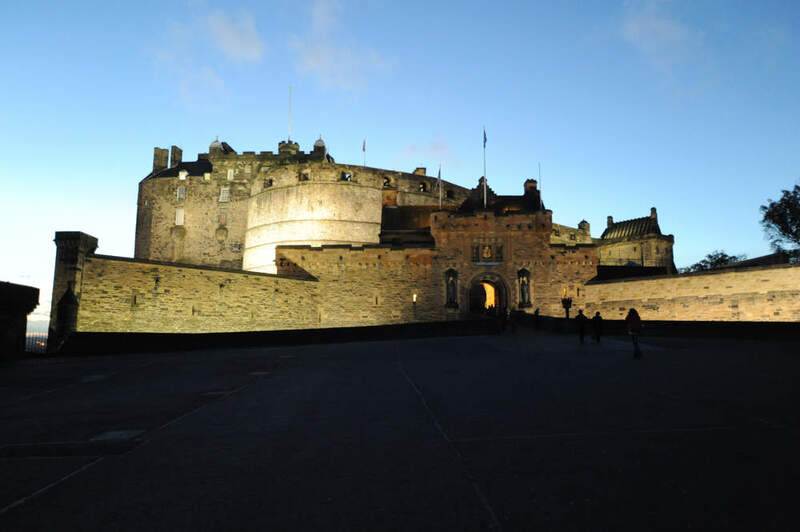 There’s always lots happening at Edinburgh Castle, from re-creations of historic events, to rock concerts, and of course the world famous Military Tattoo. Every performance of the Royal Edinburgh Military Tattoo concludes with a fireworks display (weather permitting) - and the 10:30pm performance on Saturdays has a longer extended display. As the Tattoo is held during August, it won’t be fully dark by the end of the earlier Saturday performances, so fireworks fans may prefer to book the later show for full effect. During Edinburgh’s Hogmanay (New Year) celebrations the are “countdown” firework displays from 9pm, with the full fireworks spectacular over the castle taking place on the stroke of midnight to celebrate the new year. Firework displays over the castle are also staged as the closing of the Festival is marked with the Edinburgh Festival Fireworks Concert - a 45 minute spectacular which sees the Scottish Chamber Orchestra accompanied by 400,000 fireworks! The history of Edinburgh Castle stretches back more than a thousand years. These ancient walls have witnessed momentous events in Scotland’s history, as well as a few births, many marriages, and of course thousands of deaths! 1093 A.D. - Queen Margaret (later Saint Margaret) dies at the castle. 1130 A.D. - St Margaret’s Chapel (which you can still see today) completed. 1139 - King David I holds an assembly at the castle - precursor to the parliament of Scotland. St Margaret’s Chapel dates from this time. 1174 - Castle surrendered to the English King Henry II by King William “The Lion”. 1186 - Castle returned to King William as part of the dowry of his English Bride. 1296 - Besieged by Edward I, surrendered after three days of heavy bombardment. 1314 - Scots re-capture the castle in a surprise attack at night. 1335 - Captured by the English under Edward III. 1341 - Re-Captured by Scots raiding party disguised as merchants from Leith. 1457 - Mons Meg delivered to castle. 1494 - The Honours of Scotland (Scottish Crown Jewels) created. 1511 - Great Hall construction completed. 1566 - Mary Queen of Scots gives birth to future King James VI. 1571 - 1573 The Lang Siege. Significant damage to castle. David’s Tower ruined. 1578 - Portcullis Gate and Half Moon Battery completed. 1639-1640 - Captured by Covenanters. Twice! 1650 - Captured by Oliver Cromwell’s army. 1891 - Restoration of St Margaret’s Chapel is completed. 1916 - German Airship bombs castle. 1927 - Scottish National War Memorial opened. 1942 - Honours of Scotland hidden in David’s Tower in case of Nazi invasion. For an ancient building designed with the express purpose of keeping young, fit soldiers out, much of Edinburgh Castle is surprisingly accessible, although there are inevitably areas that are impossible to get to in a wheelchair, and there are some steep cobbled slopes within the castle. The Castle has some wheelchairs available, and many of the most popular exhibits are accessible by wheelchair, though sadly not the Crown Jewels Exhibition, The Great Hall, The Military Prisons and a few others. All Restaurants and shops on site are fully accessible. There are a few parking spaces for disabled visitors that you can book in advance by calling 0131 310 5114. The castle also has a mobility vehicle available - confirm that it’s available when you want to visit by calling 0131 225 9846. Admission for carers is free - and tickets can be collected from the Visitor Information Centre. Guide Dogs and Assistance Dogs are of course permitted throughout the castle, and Braille guidebooks are available to borrow from Visitor Information. The Queen Anne Tearoom in Crown Square is a great place for a quick snack. Enjoy afternoon tea with scones (pronounced “skons” in Scotland), jam and cream, or choose from a range of cakes and sandwiches. Lots of teas, coffee and soft drinks to choose from. 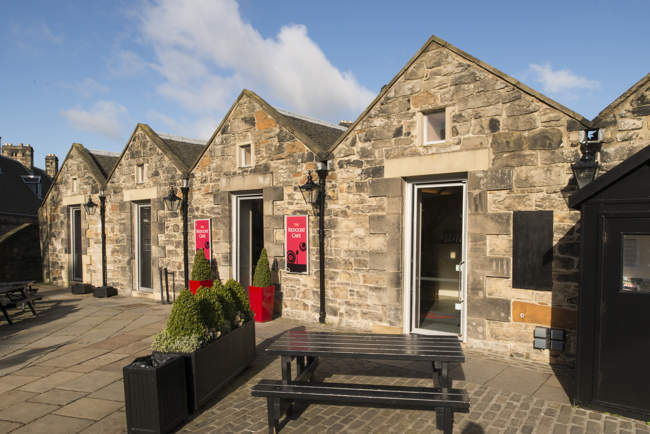 Alternatively, the Redcoat Cafe can serve anything from a light snack to a full meal (hot food is served from 11:30am to 2:00pm), including soup and even a roast. This cafe offers visitors wonderful views over the city. offers discounted parking for castle visitors. Just get your parking token validated at the audio booth within the castle before returning to your car. (Offer not available during August). The castle is quite an uphill walk from the Castle Terrace car park though - so you may want to drop any less mobile members of your party nearer the castle before going to park, or alternatively get a taxi to drop you as close to the castle as possible. The large esplanade outside the main castle entrance at the top of the Royal Mile offers visitors the chance for a quick rest from walking up-hill, and time to admire superb views over the city. Every August, this area is transformed as enormous grandstands are constructed on three sides of the esplanade to provide seating for the thousands of spectators at the Royal Edinburgh Military Tattoo. The area is also used as a stunning concert venue that has hosted many famous artists including Tom Jones, Westlife, Rod Stewart, The Proclaimers, Brian Ferry and more. What could be more romantic than getting married in a real castle? 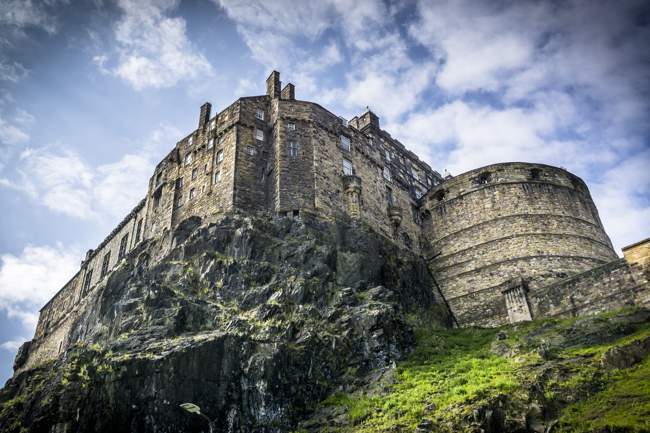 And not just any castle, but one of Scotland’s most iconic and historic buildings? 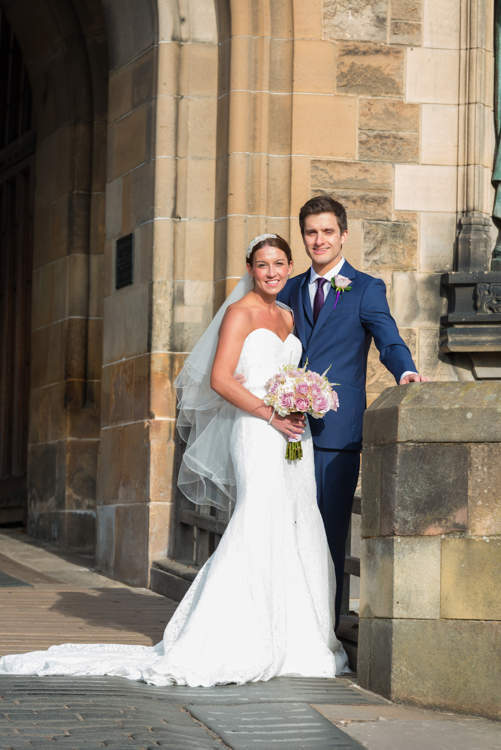 Every year lots of couples choose to tie the knot at Edinburgh Castle, which offers a choice of venues from an intimate ceremony in historic St Margaret’s Chapel which can seat just 25 people, to a large wedding in The Queen Anne Room with up to 120 at the ceremony and 170 for the reception. Other venues are available within the castle too, so couples are sure to find the perfect one for their special day. 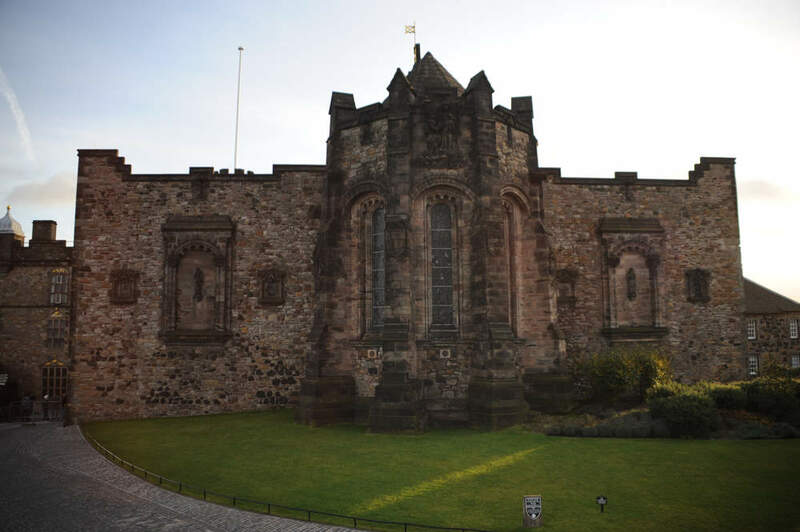 If you’re not quite at that stage yet, you could choose to propose at Edinburgh Castle, who can organise exclusive use of the romantic Minstrel’s Gallery above the Great Hall. Q. 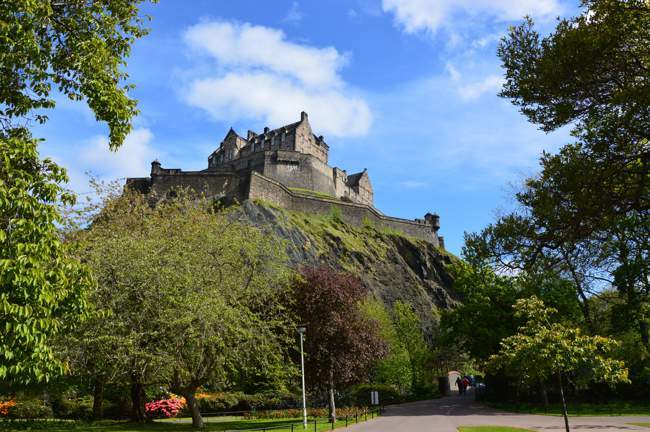 When was Edinburgh Castle Built? A. The first evidence of fortification is the remains of an Iron Age hill fort dating from approximately 100 A.D. The oldest of the buildings you can still see today is St Margaret’s Chapel which dates from around 1130. Q. How many people visit the castle every year? A. 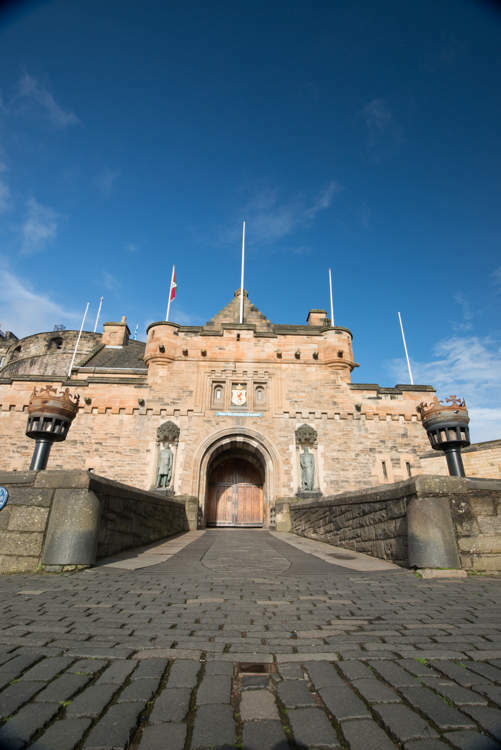 Approximate 1.5 million people visited the castle in 2015, making it Scotland’s most popular paid visitor attraction. Q. Is it cheaper to buy tickets online before we visit? A. Normally the price is the same, but you save time queuing. 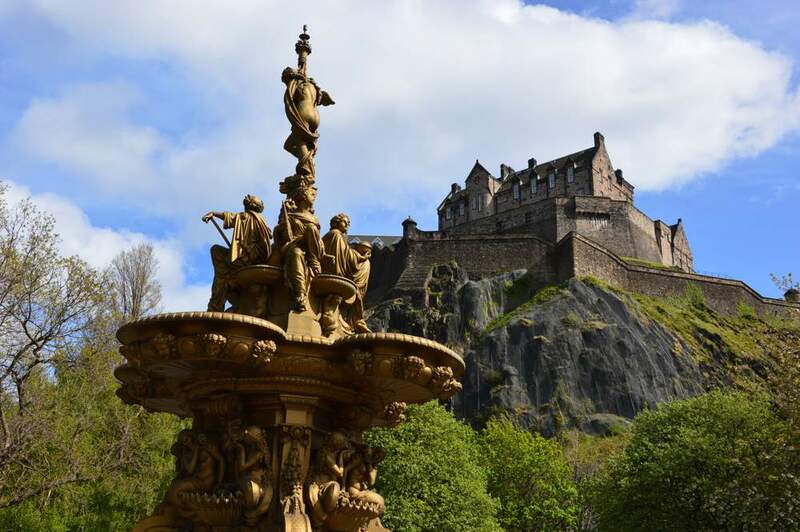 If you’re planning to visit more than one attraction run by Historic Scotland, their Explorer Passes are a great way to save money compared to buying separate tickets at each attraction. See our section on [Tickets] for details. Q. How long is the guided tour? A. About half an hour - it’s a great introduction to the castle and will help you get your bearings before starting to explore for yourself. Q. How much time should we allow for our visit? A. It’s a big castle - so we’d recommend at least a couple of hours. Q. What’s the best time of day to visit the castle? Edinburgh Castle is the city’s iconic building - it towers over Edinburgh from Castle Rock as it has done for nearly a thousand years. No visit to Edinburgh is complete without seeing this key part of the Edinburgh World Heritage Site. Open Daily 9:30am - 6:00pm. NB The opening hours of the independent museums within the castle may vary - please telephone to check. The one o'clock gun does not fire on a Sunday. The Castle is closed on 25th and 26th December, and on 1st January it is open 11am to 5pm. Please be aware prices are subject to change and may vary for special events. Audio tours are available to hire for a small extra charge. If buying online, the above tickets are fast track at no extra cost and you don't have to queue at the ticket office when you arrive. The Castle is located in Edinburgh's Old Town at the top of the Royal Mile.